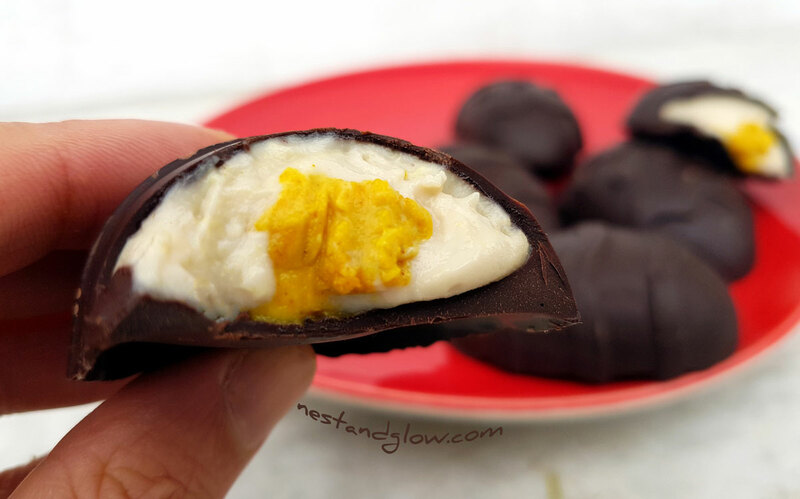 Heart healthy cashew cream eggs with no dairy or refined sugar in sight. 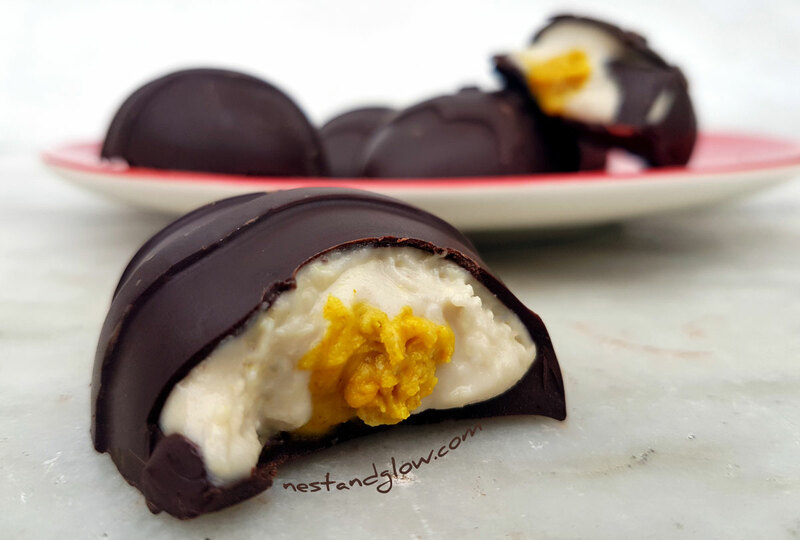 These vegan cream eggs are much easier than they look to make and taste better than the original Cadbury’s cream eggs. They have the benefit of making you feel good when you eat them. As they are bursting with nutrition, healthy fats and protein it’s much harder to overeat on them. Just one-half cashew cream egg is often enough to satisfy the need for a sweet snack. Suitable for vegan, plant-based, dairy-free, refined sugar free, natural and healthy diets. Adjust the amount of chocolate for your moulds, I have quite large ones. I tried making full cashew eggs using the moulds but they were difficult and messy to eat and to make. It works much better by making half cashew eggs and as they are quite rich, just half an egg is enough. You can wrap them in foil to make one full egg. I used silicone moulds in the video because that’s the most common type these days. You can use more rigid plastic or metal if that’s what you have. They are easy to remove with flexible silicone but a short hard tap in a rigid mould is often enough to get them out. It takes about 10 mins for the chocolate to stop being runny in the mould. I find it therapeutic rolling it around the mould making the shell slowly thicker and watching the blob of chocolate stop moving. It’s something to be done when you have time on your side. The most common question I get about these healthy cream eggs is do you taste the turmeric. You really don’t taste it as just a small amount is needed to give the golden colour. Nut free healthy Cadbury cream eggs can be made by replacing the cashew nuts with sunflower seeds. Use the same amount but soak overnight to make them sprout. Making a raw chocolate cashew cream egg by mixing 1/3 cacao, with 1/3 fat such as coconut butter or cacao butter, with 1/3 sweetener such as maple or coconut. Raw cacao has a deeper flavour and is not alkalinised so more nutritious. Melt 3/4 using a double boiler, remove from the heat and then add the last 1/4. This is an easy way to temper the chocolate. Pour 75% of the chocolate into your mould and then tilt as it drys to try to make an even coating of chocolate. Keep the remaining chocolate warm to stay liquid. Blend all the other ingredients for the cashew cream egg centre together (except the turmeric) until smooth. Use a small blender jug and shake while blending. Add a few more tablespoons of water if it’s too thick to blend. Mix a few tablespoons of the cashew cream with a pinch of turmeric to make the yellow yolk. Spoon in the cashew cream and then blob on the turmeric yolk. Place cashew cream eggs back in the freezer for 5 mins. Pour on the remaining melted chocolate and tilt to cover to seal the healthy cream eggs. Store in the fridge and enjoy within a week. Use dark dairy free chocolate to make sure they are vegan, I like an 85% in this recipe. Make nut free by using sunflower seeds instead of cashews. For me just 2 tbsp of coconut sugar was enough to sweeten this for me as the cashews add sweetness, but adjust for your tastes. You don’t taste the turmeric, but it certainly adds colour and nutrition. Use a raw chocolate mixture or raw chocolate bar to make this recipe raw vegan. Did you use raw or roasted cashews? Thank you for making that clear and updating your recipe! I made these today but my cashew cream part is brown not white I guess due to the coconut sugar, maple syrup and vanilla. This also means that you can’t get the yellow centre either just a darker brown. So disappointing any ideas how to make the cashew cream white or at least light cream coloured? Thank you for your reply, that’s what I thought I’d do next time although I just followed the written recipe and video both which ask for coconut sugar and the end result is white ???? I made these last night and they were amazing. You are right that you don’t taste the turmeric. Next time i will do bigger yolks as they were a bit small. I used honey, but it was locally produced ehtical honey. 4 table spoons was more than sweet enough. Thanks again! Perfect thank you that’s great ???? I can’t wait to try these! I love making vegan peanut butter eggs but haven’t tried something like this. They look amazing!! Thanks so much. Sorry to hear that, I wonder if soaking the cashews would stop that. I haven’t had it happen myself in any of my blenders and I’m not a scientist but there must be a way to avoid that! Maybe save the oil and stir in some hot water? Same happened to mine. It was Ok but still too crunchy, so I kept blending and it turned to something like cashew nut butter. Oh well. Hi there, I’m a vegan site so I really wouldn’t know anything about animal fats!